In the award-winning tradition of Tetris, comes BreakThru. This time, your goal is to make as many bricks disappear as you can before time runs out. Click on a group of same-colored bricks to remove bricks and make the wall come tumbling down while battling the clock. Bombs fall and huge sections of the wall blow apart. Tear down wall after wall as you race the clock to raise your score. Test your skill in six cities - from Berlin to Beijing - each with original music and scenery. Watch out for pesky spiders, annoying soda cans and obnoxious boulders which are out to make life rough. Knock them out of action with rockets and bombs before the clock finishes you, so you can break through to the next wall. It has 4 skill settings and multiple levels mean increasing speed and challenge. 3 time settings dare you to beat the clock. 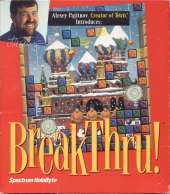 Alexey Pajitnov, the creator of Tetris, is featured on the cover as endorsing the game but did not create it.